When a 1,000-foot convoy carrying the nonprofit Space Center Houston’s historic shuttle carrier aircraft needed a safe transport, they put their trust in Quality Mat Company. The shuttle began its eight mile journey during the late hours of April 28th and reached its final destination on April 30th, 2014. Old Galveston Road was host to the transportation of the amazing Shuttle 747 on April 28th. Roads were closed so workers could dismantle streetlights and other objects that could get in the way of the incredible 1,000-foot convoy that was transporting the historic shuttle. How did they move this enormous aircraft safely? A big part of the move was thanks to the dependable and durable construction of laminated mats provided by Quality Mat Company. The shuttle made its way from its existing resting spot on Ellington Field to the Space Center Houston, where it will remain. The shuttle, slated to rest during the early morning and afternoon took a rest on East Commerce Street near NASA parkway before finishing its trek on the westbound lane of NASA parkway. The move was thoroughly planned to ensure no utilities were interrupted, and made possible by the help of many private, public, and government agencies, one group being Quality Mat Company. The Boeing 747 was disassembled and put onto six different trailers during its journey. Laminated mats designed and supplied by Quality Mat Company were used to provide stability and ensure the safe transportation of the historic Boeing 747. These 3-Ply laminated mats, measuring 8’x16’x3’, are commonly used throughout the drilling industry. Laminated mats from Quality Mat are designed to be able to fulfill many purposes, and are extremely well known for their performance at supporting and stabilizing heavy loads. 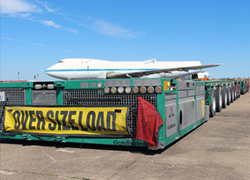 Moving at a safe walking speed and supported by Quality Mat Company laminated mats, the six pieces of the Boeing 747 moved with ease to the Space Center Houston. The largest section of the Boeing 747 remained intact and stayed safe thanks to the laminated mats from Quality Mat. The 600,000 pound aircraft safely made its way to Space Center Houston where it will be pieced back together and have the space shuttle replica Independence positioned on top. When it opens to the public in 2015, the complex will stand at over eight stories tall. Thanks to the dependable and durable construction of laminated mats from Quality Mat Company, the historic Boeing 747 will be enjoyed by visitors for years to come. Quality Mat Company is the industry’s number one source for crane mats, rig mats, laminated mats, and more. Quality Mat has produced the industry standard in ground protection mats since the company was founded in 1974 by Joe Penland Sr. Quality Mat Company is based in Beaumont, Texas.